Building on the success of the incredible P20 Pro, with its luscious Leica triple-lens camera, the new Mate 20 Pro takes things to the next level. Not only do you have one of the most detailed and versatile camera arrays in the smartphone industry at your disposal; you can also be among the first to utilise new technologies - a dual Neural Processing Unit (NPU) and under-screen fingerprint sensor. For the first time in a mainline smartphone release, the fingerprint sensor is built right into the screen. Instead of trying to find a place under the screen, on the side, or around the back, Huawei has built the technology inside the front glass. First seen on their limited edition Porsche Design range, the technology has been refined and is now considered ready for the mainstream. Huawei's Kirin 980 octa-core processor with 7nm technology is the first of its kind. With a dual NPU (Neural Processing Unit), the Mate 20 Pro can achieve machine learning and AI efficiencies never before seen in smartphone hardware. 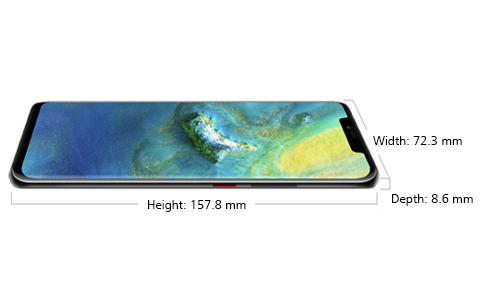 Finally the design of the Mate 20 Pro maximises the display area. A stunning 6.39-inch screen reaches to the very edges of the phone in a 19.5 : 9 ratio.